Eun-Hee Ji of South Korea left the mistakes to everyone else down the stretch in the LPGA Tour season opener. Ji managed a strong wind and temperatures in the 50s F on Sunday by making three birdies on the back nine to pull away and close with a 1-under 70, giving her a two-shot victory in the Diamond Resorts Tournament of Champions. Brooke Henderson of Smiths Falls, Ont., started the day a shot behind the leaders but struggled on Sunday, shooting a 4-over 75 on the round. That put her into a tie with Stacy Lewis for sixth at 8 under for the tournament. 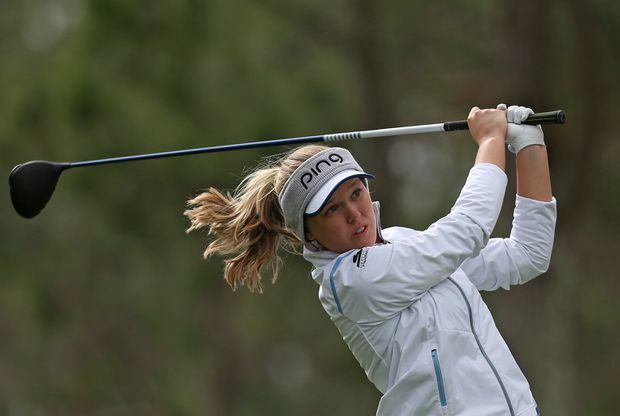 Brooke Henderson hits her tee shot on the fourth hole during the final round of the Diamond Resorts Tournament of Champions at Tranquilo Golf Course at Four Seasons Golf and Sports Club Orlando on Jan. 20, 2019 in Lake Buena Vista, Florida. The LPGA opener was limited to winners over the past two seasons. It also included a celebrity field of athletes and entertainers who competed for a $500,000 purse using the modified Stableford scoring system. Lewis, in her first competition as a mother, shot 70 and tied for sixth. Ariya Jutanugarn, the No. 1 player in women’s golf who captured every major award last year, went into the weekend two shots out of the lead and closed with a pair of 75s to tie for 18th. Her sister, Moriya Jutanugarn, managed a bogey-free round for a 69 to tie for fourth with Shanshan Feng (70). The LPGA is now off for two weeks before resuming in Australia for the Vic Open.